6.10m2 200watt per sqm heating mat for High Output 0.5m wide and 12.20m long. Excellent when there is great demand for rapid response time and high output. High output per m² resulting in instant warmth gives the DTIF-200 a number of possible uses:. 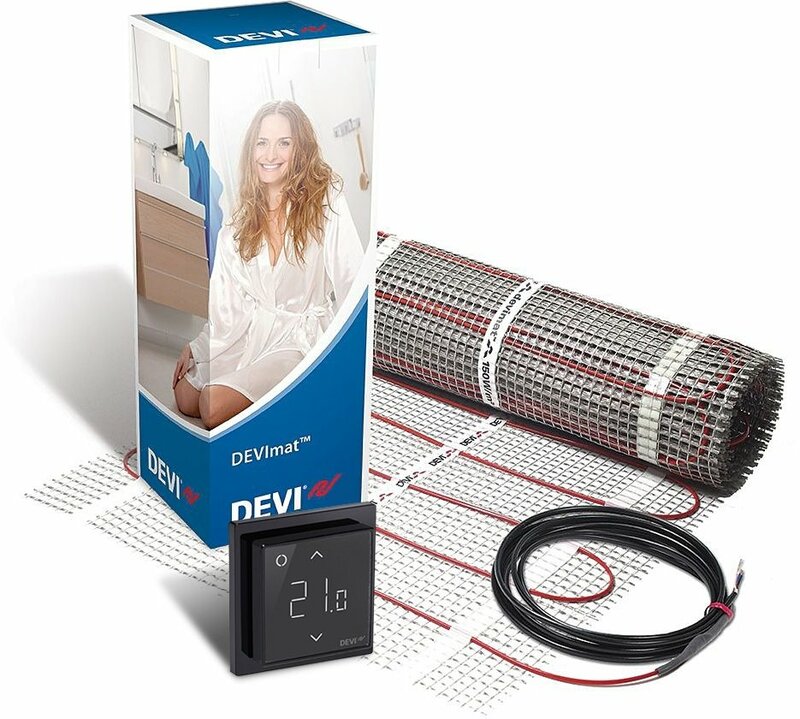 Devimat is a prefabricated, self adhesive mat with a thin heating cable ready mounted, all within 4mm thickness. It is an open mesh design allowing the tile adhesive to bond to an existing floor. The mats are available in a range of sizes from 1.05-10.5 square metres. Each mat is 0.5 metres wide. The heat output of this product can be regulated using a controller. Generally only one controller is needed for this product, however, for larger areas, one controller per 17m2 should be used. There is a choice of wall mounted thermostat the most popular being the Devireg 550. This product can be used for Bathrooms/En-Suites and Kitchens. In fact, this system can be used in any room as long as the heating mat is covered by a flexible tile adhesive/self-levelling compound. The luxury of a comfortable warm tiled floor, high standard of comfort, provides even heat across the floor surface, economical, no significant floor height increase, simple to install, guaranteed for 20 years, and gives you a dry floor with no mould.